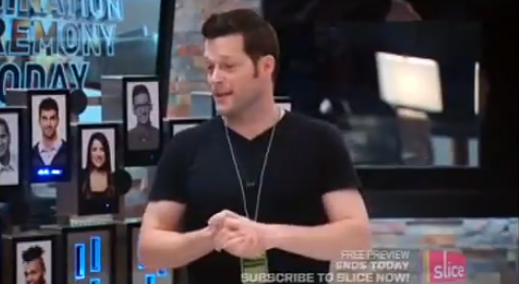 Tonight on Big Brother Canada another twist was put into play. It was going to be an instant nomination and an instant eviction. Topaz wins the HOH competition not knowing that this HOH rule was going to be quick and dirty. It was an instant eviction day. Right after the HOH competition Topaz is called up into the HOH room. Arisa appears on the HOH TV and tells Topaz that she has five minutes to nominate 2 people for eviction. What Topaz doesn't know is that the rest of the houseguests have gathered in the living room and are watching her conversation with Arisa. Topaz has a debate with herself about who she should put up on the block...unfortunately for her she does it out loud and everyone in the living room hears what she is saying. She says that the house would like for her to put up Talla, but she doesn't want to do that. She says she could put up Jillian and Emmett, but she won't. Then she lands on AJ and Andrew. She says that she would put them up, but that she wouldn't want AJ to go, her target would be Andrew because he is the bigger threat. Arisa then asks her for her final nominations. She says Andrew and AJ. Topaz heads back downstairs to the other houseguests without knowing that she has just showed her whole game to the house. 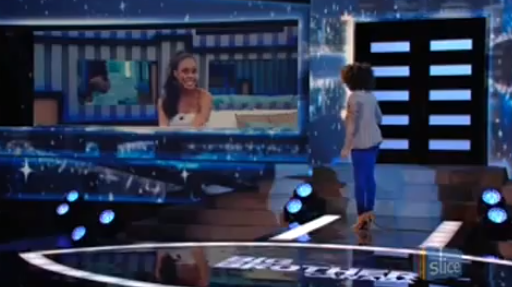 Arisa tells her that the houseguests know who was nominated because they were watching her HOH talk with Arisa. Topaz looks shocked. Andrew and AJ go on the block and they think that they are going to be playing in a veto competition. Arisa then breaks that news that not only is this an instant nomination, but also an instant eviction without the chance to play for a PoV. Everyone is then required to vote for who they think should go home. Topaz's goal was made clear to the house so you would think they would vote to evict Andrew. Emmett votes to evict AJ. Gary votes to evict Andrew. Talla votes to evict Andrew. Peter votes to evict AJ. In a vote of 4 to 2, AJ is evicted from the Big Brother house. AJ doesn't seem too upset by the outcome and is pretty laid back as he goes outside to talk to Arisa. He is now the first of the Big Brother Canada group to enter the jury house. Back in the house the HGs tell Topaz that they were able to hear everything that she said to Arisa. Topaz is frantically trying to remember what she said and who she talked about - she knows she is screwed. In the bathroom Peter tells Emmett that Topaz is a complete moron for talking out loud as that is not something he would have ever done. He also says that this is a good thing because it puts a target on her back and she will be out of the house soon. Topaz and Alec talk and Topaz asks him why he voted to evict AJ when she clearly wanted to get Andrew out. She knows that this is really going to mess up her game now and it is clear to her that Alec does not have her best interests in mind at all. Gary and Topaz talk about how Alec screwed her and that the showmance is now officially off. Alec says that he is glad the showmance is over and he is going to try to get the sympathy card from the rest of the house and pretend like he wants to get back together with Topaz. He also says that Andrew will now feel more indebted to him because he went against Topaz to keep him in the house. The next HOH competition happens and Topaz is not eligible to play. The HGs have to identify which of the evicted HGs said which quote in the diary room. In the end it was Talla and Andrew with the most correct answers and it went to a tie breaker. (I must point out that Talla is constantly coming in second place in competitions...she is doing better than most). They have to guess the amount of yellow balls used in the Bee competition. They both undershoot, but Andrew is closer. 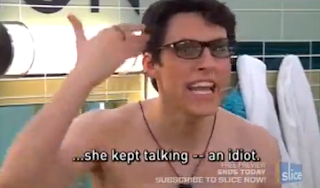 Topaz then has to announce that Andrew is the new HOH. Andrew also is given the responsibility to name the 4 Have Nots for the week. Emmett has a slop pass so he is the first selected. Peter volunteers. Andrew names Topaz because she nominated him and Gary because he had never been on slop before. Everyone else took the Have Not status well...except for Gary. Gary freaks out and runs into the house crying. It was so dramatic that everyone thought he was joking. He wasn't. It was the most hilarious thing we have seen on this show to date. It is pretty clear who Andrew is going to nominate, after Topaz called him her target. 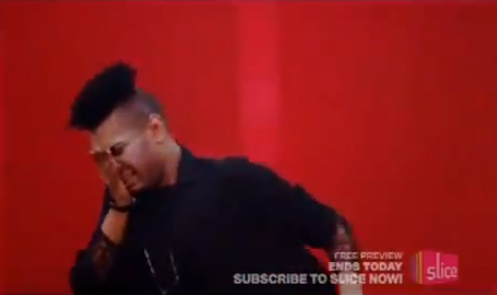 Gary goes up and talks to him and Andrew tells him that he is going to nominate him and Topaz because Topaz nominated him and he voted for AJ to stay. Andrew tells Gary that Topaz is the target. The nomination ceremony happens and Topaz and Gary are nominated. Tuesday is the PoV competition and we find out who goes home on Thursday!